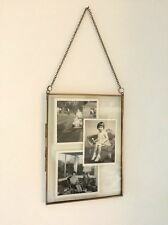 Antique Brass Glass/ Metal Picture Photo Frame Vintage Style Portrait 7x5 or 8x6 5x7"
Would fit photos 4" X 6". They are finished with a clear wax for protection! 45.5 cm X 35.5cm approx - see photo. 48.5 cm X 38cm approx - see photos. sold without glass or backing. With Print, Cats & Teddy Bear. Zoom in on photos for better view of detail. and I will do my utmost to resolve any issues. From KENRO. Piazza Antique Series. Wide 35mm profile with ivory beads design. Fitted with glass shield to protect your photos from dust. 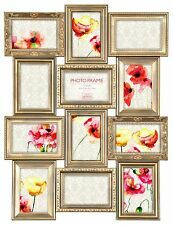 Suitable for photo size 4'6 ( 10 x 15cm ). Product images: We try to use high resolution clear photos, however due to the nature of the product and lighting conditions the actual products may slightly differs. Antique style collection. Pink and white. By CASA CHIC. White Wooden. 5 x7 photo. 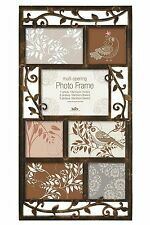 20x25cm leather laura ashley photo frame Used Dispatched with Royal Mail 2nd Class. This was very expensive but is a little too ornate for my setting. 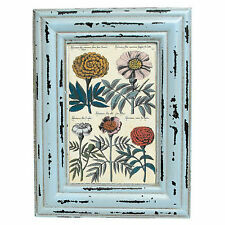 ~ Antique style ~ wooden ~. total size is 22" x 18". Antique Black Wood Picture Frame, Gilt Slip, Glass (Flemish Print) 22.25x27.25"
Gilt slip is marked in places as expected. Currently in portrait orientation this can be re hung for landscape display. Original riven glass is in excellent condition given age. Colour - It will be noted if there is more than a slight discrepancy from photographs. Vintage Antique Style Wide Chunky Rococo Gold Gilt Picture Frame 20" x 17"
KERNOW FURNITURE LTD. Condition: General age and wear. 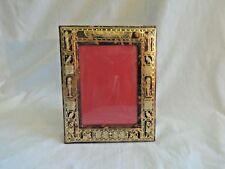 Egyptian Genuine Leather Brown Picture Frame Handmade Pharaoh 7.5" X 6"
Lot of 22 Antique, Gold Metal Frames - Perfect for weddings and home!